For those tuna purists out there asking “You did what with tuna?” you really need to try this dish. For those of us trying to watch our diet, this is a beautiful meal. And who doesn’t like a good taco? As you know, we eat very little red meat preferring to consume our calories by eating poultry and seafood. We also try to minimize our fats, other than omega 3s found in seafood and fish. Of course, none of these things mattered when we were younger. Age, however, does some peculiar things to your health and mind set. Good thing we love tuna. I have been wanting to do this for a while now and finally got around to it last night. We like Mexican food and try to do it in a healthy fashion. We like Fish Tacos with Garlic Salsa, Ceviche, Mussels with Chorizo and Red Chiles, Grilled Lobster with Cilantro-Lime Butter, etc. The list could go on and on and on. Most people don’t realize that seafood is a major part of Mexican cuisine. 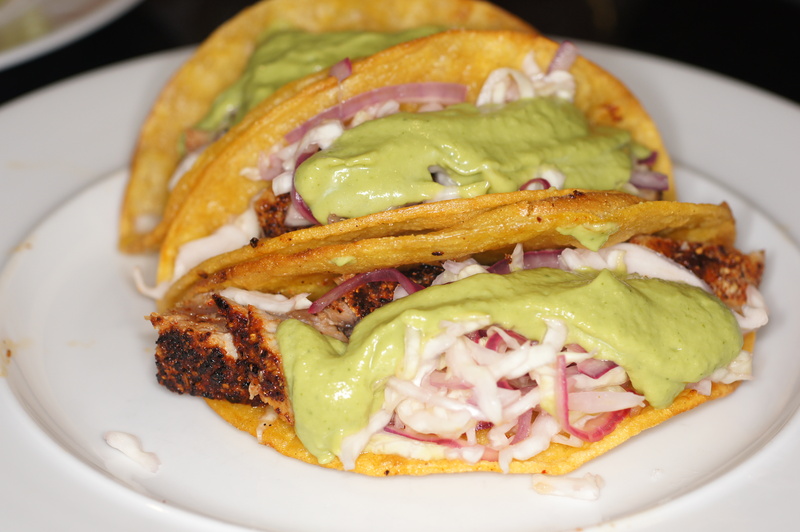 It’s so much more than Tacos al Pastor, Carnitas, Fajitas, Burritos, beans and rice, etc. While we like all of these dishes, they don’t like us nearly as much. As such, when we make Mexican food, it’s generally seafood or fish. This dish is a wonderful, somewhat healthy, dish depending upon whether you make your own taco shells and how you make them. We actually fried these because that is how i like them, which blows the calories out of the water, but you can bake them with a little Pam if you’re counting calories and trying to avoid fats. You can also buy some relatively healthy taco shells at the market now if you don’t want to mess with making your own. 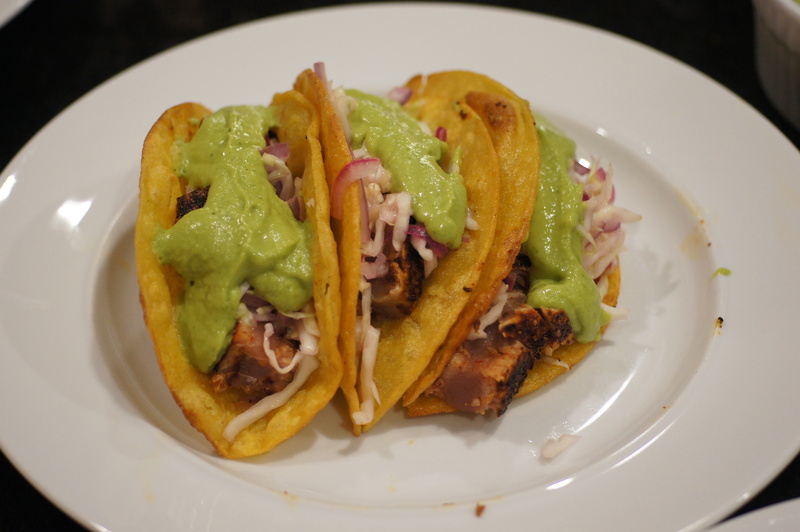 Regardless, these tacos are wonderful. Give them a try. 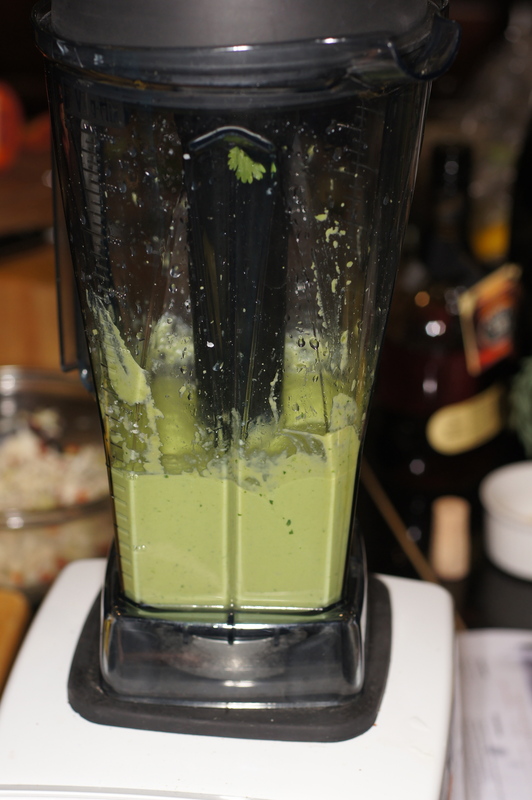 In a blender jar combine the peanuts, chile, cilantro, lime juice and 1/2 cup water. Blend until completely smooth . 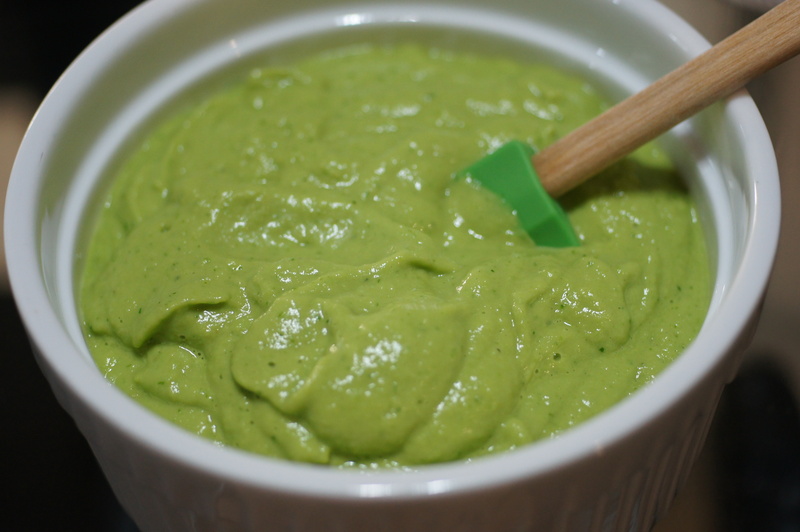 Add the avocado and pulse until thoroughly blended. Taste and season with salt, roughly 1/2 teaspoon. Thin with additional water, if needed. Put in a bowl and set aside. Combine the cabbage, onions and lime juice in a bowl. Cover and put in the refrigerator for 2 – 3 hours. Season with salt to taste. 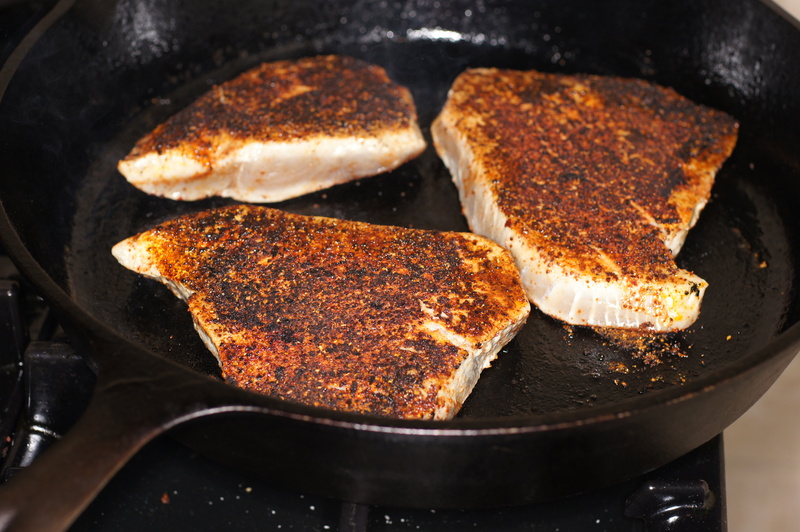 Season the tuna with the Ancho Chile Rub. Place in a hot skillet and sear on both sides, roughly 45 seconds per side. Remove the tuna from the heat. Cut the tuna into strips. Put the tuna strips into the bottom of the taco shell. Add the red onion cabbage mixture and top with the Avocado, Peanut & Lime Salsa. Serve and enjoy. I wouldn’t doubt it if I could eat just the salsa with a spoon! Actually, we did and it really is good!